No key dates for 1959 through 2008 dated Lincoln Memorial Cents but the two best dates are 1960 (no mint mark) Small Date and the 1970-D Small Date. You do have some doubled die varieties worth a premium and this is explained in the varieties section. The good thing about Lincoln Memorial Cent value is the 95% copper content from 1959 through 1982 because they’re worth near three times face so collectors do hoard them. Collectors also pay a premium for BU (Brilliant Uncirculated) rolls because they look for the varieties. The proof versions are worth a bit of a premium if it when they’re dated 1959 through 1981-S and there’s a few varieties worth looking though proof and mint sets for. 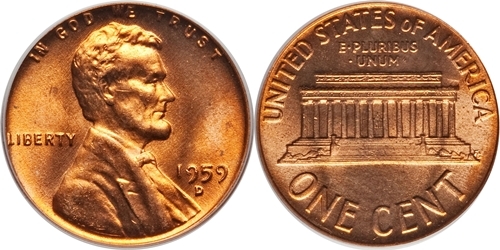 Most Lincoln Memorial Cents are not worth much above their copper melt value since most are common and non-variety types, but there’s a grade threshold that does garner a premium. Just remember MS66 for dates 1959 through 1983 Lincoln Memorials in that grade can be worth $10 and up in Red (RD), and MS67 they can be worth anywhere from $40 to well over a $1,000. A 1982 Small Date Lincoln Memorial value in MS67 is $2,800 and that’s if it’s in a PCGS holder with the grade. A PCGS Secure Plus is worth over $10,800 in MS67. Raw coins do not realize this premium, not even close, so watch out for over-graded coins. I can tell you from experience that it’s extremely difficult to get MS67 grades for Lincoln Cents. Note that when I mention a grade like MS that means the coin is problem free – never cleaned, not pitted, or damaged in any way. If the coin has a “grainy” appearance or seems to have tiny holes, or scratches, or looks “pinkish” then it’s a problem coin and will sell for less than the values listed. You also have three conditional factors that determine the value of a Lincoln Memorial Cent and they are: Red (RD), RB (Red-Brown), BN (Brown). A RD coin is going to have at least 90% original luster as struck by the mint and is the most valuable condition. The luster conditions only apply to mint state coins so any circulated coin will be designated BN. Lincoln Cent Memorial value is in the varieties and one aspect of collecting that keeps these mostly common coins in demand. Collectors search through rolls, mint sets, proof sets and collections looking for the rare varieties. The 1969-S Doubled Die Obverese (DDO) is the top coin and has sold for upward of $105,000 in MS64 and can sell for upward of $20,000 in circulated grades with only 30 known and more to be found. You should always look for doubled dies and make certain they’re the most valuable examples since some dates have several different doubled die examples but only one version is worth the big bucks. For example, the 1955 date has 15 different doubled die varieties but only one is worth a lot and a couple others are worth even less of a premium but the others are not worth much at all. The same goes for most doubled dies for every date so have them checked out first before thinking you’re going to cash in. Also look for the 1992 Close AM in AMERICA and the 1998 through 2000 Wide AM plus the proof doubled dies and 1979-S and 1981-S mint mark types. Mint Mark: Under the date D,S but no mint mark for Philadelphia (P). Lincoln Memorial Cent value by date, grade condition and variety.